I generally don't decorate for seasons. Not because I don't appreciate seasonal decor but I tend to put all my energies into Halloween and Christmas and I'm just all decorated out after that. 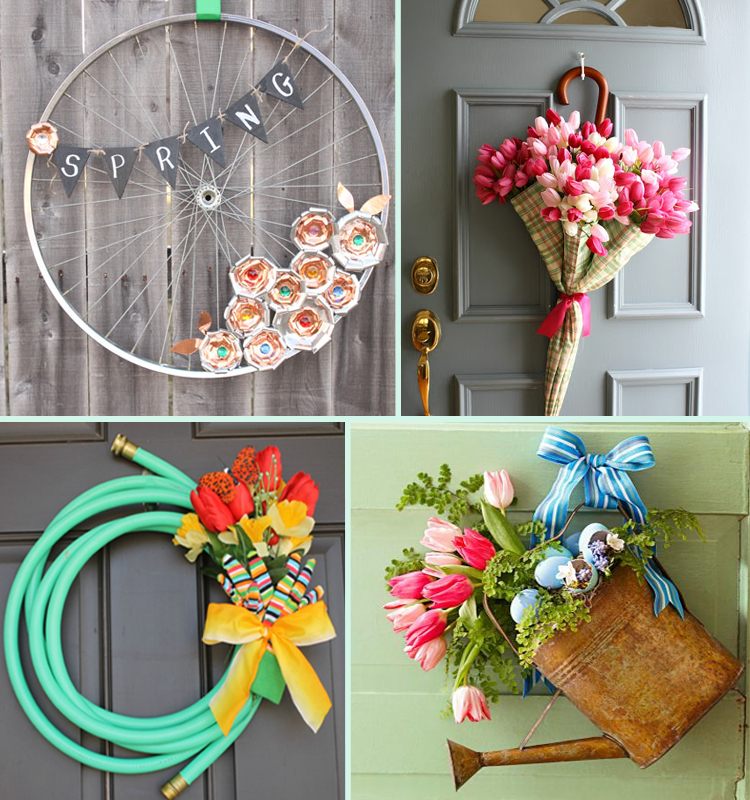 But I've seen some great spring wreath projects lately that I wanted to share. I pinned this giant hoop wreath ages ago and it's been lingering the back of my mind every since. It got me to thinking that the wreath on a homeowner's front door can say a lot about who lives inside. Am I right? So with that in mind, here are a few inspired ideas that might suit your personal style (and won't take more than a lazy spring afternoon to make!). Clean lines? Mid century? Try a naked wreath. 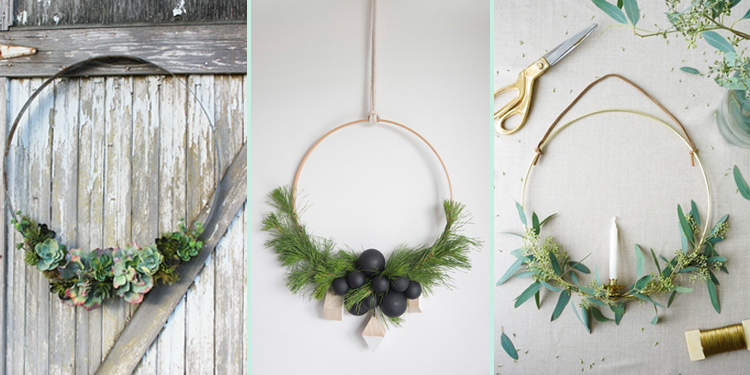 The whole "naked" wreath trend is amazing. All of the graphic punch with 1/10 of the work! Glue pretty much anything pretty to a metal craft ring or embroidery hoop and you have an easy modern focal point for your door. Farmhouse vintage more your style? Go with old charm. Ditch the wreath altogether and drag something with a bit of rusty charm out of your garage and fill with flowers or greenery. Voila! Instant classics. Traditional with style? Go for a updated classics. Just a slight twist on your standard wreath but something a little different than the everyday. Now to only pick one style and actually make one. Or in my case 2 since I have double doors. 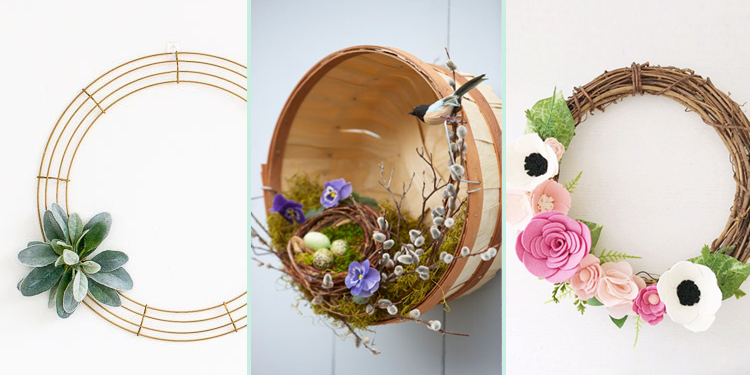 Anyone else getting a hankering to add a little spring decor to your house? Wow - I LOVE the umbrella with flowers. I usually find that stuff a little kitschy, but I felt myself gasp as I looked at that photo! You are so right that the wreath is a reflection of the homeowner(s). The hoops are so very pretty and something different. I love all the flowers with the umbrella but the umbrella is not me. I spent weeks looking for something online as I did not have time to make one for spring and I have a newly painted front door. I ended buying one on Wayfair which I love. Will share it on my blog soon.